After watching Famous Dave Anderson on Food Network's BBQ competition show Best in Smoke, I made it a point to finally give his restaurant a try. I really did not know what to expect other than the fact that I was going to be trying some BBQ. When I walked in, I immediately liked the cabin feel of the place. Almost like a hunting lodge with its walls of memorabilia. It took me back to our trips to Tennessee and the Great Smoky Mountains. When we walked in, there wasn't anyone at the hostess stand to greet us. We waited a few minutes and when she realized we were there, she nicely greeted us and sat us down. From there on out, service was good. 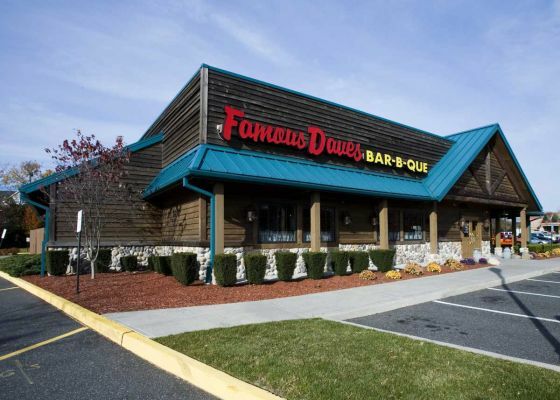 When our waiter came over, he asked if we had ever been to Famous Dave's before and when we said no, he informed us about their many flavors of BBQ sauce. He returned with our drinks, a plate and some chips and then went through each sauce by squirting its name on the plate. We were able to try each one with the chips and it was a nice way to start the evening and to kill time while waiting for our food. We ordered the half-slab of St. Louis Style ribs and the combo of brisket and BBQ chicken. They both came with corn bread and two sides. The sides we got were corn on the cob, drunken apples, garlic red-skinned mash potatoes and steamed broccoli. The mashed potatoes and drunken apples were excellent! The ribs were fall off the bone good and didn't need any additional BBQ sauce. The brisket was pretty good, nothing over the top on its own, but it was elevated by using the sauces. I actually preferred the chicken over the brisket. It's not like the brisket was bad, I just liked the chicken better! We split a piece of pecan pie for dessert which was also very good. The prices are about spot on to where they should be expected. Not overpriced but not a bargain either. We think it's worth it! Overall, service and the food were very good and we look forward to returning when we are in the mood for some good BBQ!